Written by SoundFX.studio on March 25, 2019 . The M2 Browning Sound of .50 Caliber aircraft-mounted heavy machine gun from the WW2 Weapon SFX sound library. The .50 BMG Browning or 12.7 mm AN/M2 had a cyclic rate of 600–800 rounds per minute. Many aircraft such as the Curtiss P-40 Warhawk, P-47 Thunderbolt, P-51 Mustang, F4F, F6F and the F4U used these guns during WWII. For example, in this library you can find the sounds of M2 Browning for P-51 Mustang. It was armed with six guns. The M2 Browning sound consists of the looped audio file 8 seconds long and the ending file, which should be played at the end of the shooting. The WW2 Weapons SFX Library library includes 28 audio files. The Mustang Gun Sound is the sound of 6 × 0.50 caliber (12.7mm) AN/M2 Browning machine guns from the WW2 Weapon SFX sound library. M2 Browning had 1,840 total rounds (380 rounds for each on the inboard pair and 270 rounds for each of the outer two pair). The AN/M2 aircraft gun had a cyclic rate of 750–850 rpm. Many aircraft such as the Curtiss P-40 Warhawk, P-47 Thunderbolt, P-51 Mustang, F4F, F6F and the F4U used these guns during WWII. The M2 Browning sound consists of the looped audio file 12 seconds long and the ending file, which should be played at the end of the shooting. The WW2 Weapons SFX Library library includes 28 audio files. The M2 Browning Cockpit Sound is the sound of an .50 Caliber aircraft-mounted heavy machine gun from the P51 Mustang cockpit. The .50 BMG Browning or 12.7 mm AN/M2 had a cyclic rate of 600–800 rounds per minute. Many aircraft such as the Curtiss P-40 Warhawk, P-47 Thunderbolt, P-51 Mustang, F4F, F6F and the F4U used these guns during WWII. Also in this library you can find the sounds of six M2 Browning guns firing from P51 Mustang. The M2 Browning Cockpit sound consists of the looped audio file 10 seconds long and the ending file, which should be played at the end of the shooting. The WW2 Weapons SFX Library library includes 28 audio files. The Mustang Gun Cockpit Sound from the WW2 Weapon SFX sound library is the sound of 6 × 0.50 caliber (12.7mm) AN/M2 Browning machine guns firing from the P51 Mustang cockpit. M2 Browning had 1,840 total rounds (380 rounds for each on the inboard pair and 270 rounds for each of the outer two pair). The AN/M2 aircraft gun had a cyclic rate of 750–850 rpm. Many aircraft such as the Curtiss P-40 Warhawk, P-47 Thunderbolt, P-51 Mustang, F4F, F6F and the F4U used these guns during WWII. The M1919 Browning Sound is a sound of M1919 variant – Browning .303 Mark II machine gun. Even after the introduction of autocannon as primary fighter armament .303s were retained as supplementary weapons on many aircraft including later versions of the Supermarine Spitfire and Hawker Hurricane, as well as fighter-bomber and night fighter versions of the de Havilland Mosquito, among others. For example, in this library you can find the sounds of Browning .303 Mark II for Supermarine Spitfire. It had four guns with 350 rounds per gun. The machine gun sound consists of the looped audio file 8 seconds long and the ending file, which should be played at the end of the shooting. The WW2 Weapons SFX Library library includes 28 audio files. The Spitfire Gun Sound is the sound of M1919 variant – Browning .303 Mark II Four-Gun Firing from the WW2 Weapon SFX sound library. Even after the introduction of autocannon as primary fighter armament .303s were retained as supplementary weapons on many aircraft. Such as later versions of the Supermarine Spitfire and Hawker Hurricane. As well as fighter-bomber and night fighter versions of the de Havilland Mosquito, among others. Supermarine Spitfire had four guns with 350 rounds per gun. The Spitfire gun sound consists of the looped audio file 12 seconds long and the ending file, which should be played at the end of the shooting. 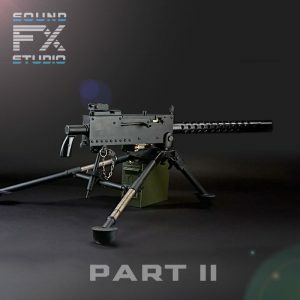 The WW2 Weapons SFX Library library includes 28 audio files.